Authorities in Oklahoma have arrested a man wanted for a February murder in western Iowa. Twenty-year-old Luis Trujillo-Mendez will be charged with first-degree murder for the death of 27-year-old Lorenzo Nambo Garcia of Denison. 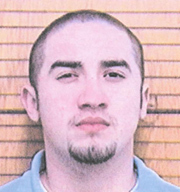 Garcia’s body was found in a ditch near Dow City in late February. Crawford County Sheriff James Steinkueler says Garcia disappeared on January 5th. "On this date, a witness reports seeing…an acquaintance of the victim driving by the residence on two occasions," Steinkueler says. "…The witness left the area on personal business and never saw the victim again." The sheriff says about a week after Garcia’s body was found authorities obtained a warrant and searched Trujillo’s residence in Denison. "In Luis Trujillo’s residence, a pistol and ammunition were recovered. A wallet belonging to the victim was also recovered during the search," the sheriff says. "On March 16, 2009 a vehicle belonging to the relative of Luis Trujillo was identified as the vehicle Luis Trujuillo was driving the night the victim disappeared." That evidence was processed at the state crime lab. "It was determined that the ammunition found in Luis Trijuillo’s residence was consistent with the bullets found in the victim’s body. Ballistics of the bullets found in the victim’s body matched those of the pistol found in Luis Trijuillio’s residence," the sheriff says. "Inside the vehicle…DNA was recovered that positively matched that taken from the body of the victim." Crawford County Attorney Michael Mundt says putting all those pieces together is a credit to the law enforcement officials involved. "For weeks before they found the body, I frankly (had) little hope that they would be able to unravel this case," Mundt says. Trijuillio faces life in prison without parole if found guilty on the first degree murder charge. He’s currently being held in Oklahoma and will have to be brought back to Iowa to face the charge. If you have any information in this case you are asked to call the Crawford County Crimestoppers Hotline at (712)263-4050.